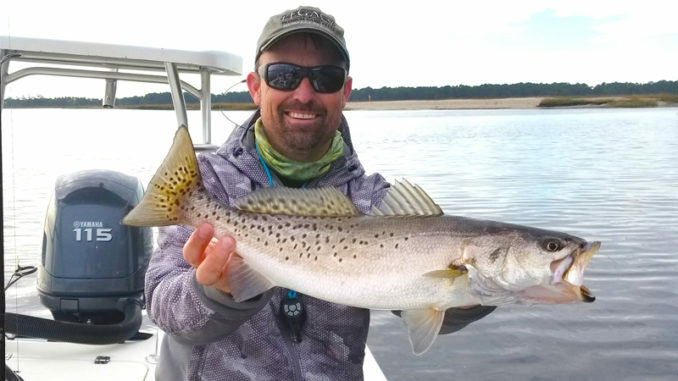 Speckled trout are biting topwater lures along the Carolina coastlines. It’s winter time, but if you’ve been fishing lately, you probably felt more like it was spring or late fall. 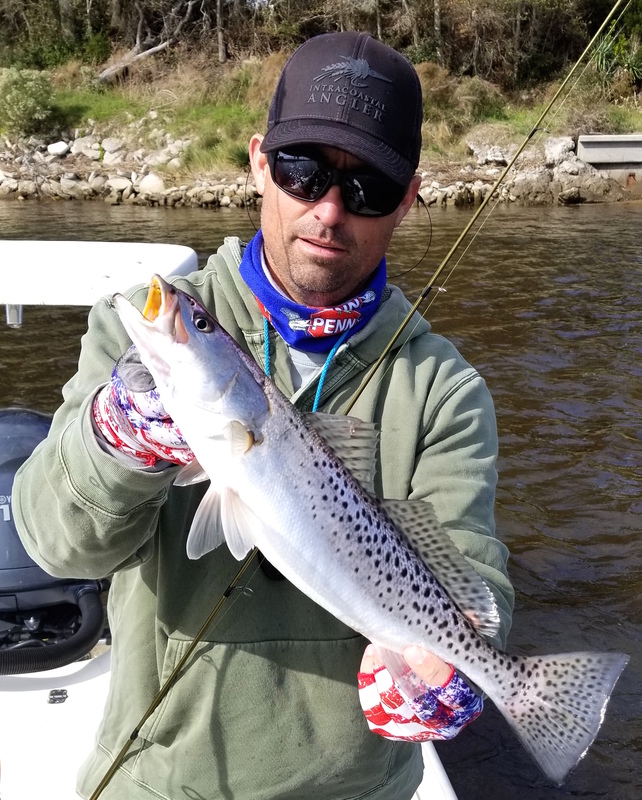 The speckled trout bite is going strong up and down the coast of both Carolinas. And one of the hottest bites has been the topwater bite. For speckled trout anglers, it’s tough to beat a topwater bite. And while winter isn’t typically a time for casting surface plugs, the technique has been working much better than most anglers have expected. “When we get these kind of temperatures this time of year, you never know how long it’s going to last. You have to take advantage of it when the chance comes,” said Miles Farnsworth of Adams Run, S.C., who usually winterizes his boat every December, but hasn’t this year. He’s been catching trout in the creeks around Edisto Beach and Charleston. “I was really hoping to do some cold weather fishing this month. But I’m not complaining. My go-to lures for the past week have been two lures by LIVETARGET. In open water, their Mullet Walking Bait has been killing it. And I just started using their Hollow Body Mullet after getting a Christmas stocking full of them. I’ve been using them in the grassy areas,” he said. 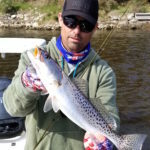 Farnsworth is catching most of his trout on the incoming tide while fishing in fairly shallow water that has oyster shell bottoms. He has also caught a few at high tide in the grass. Last January, extreme cold killed off many trout. But this year, so far, so good. 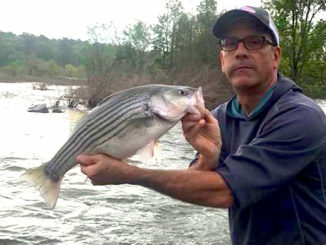 David Partin of Wilmington, N.C. is having similar luck in the Cape Fear River, especially around the Fort Fisher State Recreation Area. He’s using different lures, but getting the same results as Farnsworth. “I’ve been wearing them out on topwater with Super Spook Jr. lures. Just a basic walk-the-dog pattern of twitching, pausing, reeling, twitching, pausing, reeling. It’s been like the spring and fall bite for sure. I’m not finding them shallow though. I’m catching them in 7 and 8 feet of water in small creeks. The key has been hitting the water around the first set of oysters in a secondary creek, where it is closest to the main river channel. So when I leave the river to head up a creek, I’m catching the most fish closest to the very first set of oysters I see in that creek,” he said. And Partin said while most anglers anchor down and cast toward the shore, he does it differently. “I get as close to the bank as I can get, then cast out toward the middle of the creek. So when I’m reeling, it looks like baitfish heading to the shallows instead of swimming away from it. I think this works better, especially when the tide isn’t moving at all. I don’t have trouble catching them then,” he said. Partin said he only uses two colors. “It’s all I need. One is chartreuse with a black head. The other is white with a chartreuse head. I keep one of each on two different rods. I’ll throw one for a few casts, then use the other one, back and forth. On some days, one will outperform the other, but on other days, the fish hit both equally,” he said. The two anglers disagree on what will end the topwater bite. “I think it will go on until the first hard freeze. That will shut them down and the trout will hunker down in the deepest water they can find. They’ll still bite, but not on top,” said Farnsworth. “I think it will just taper off as the air temperature steadily drops. It will probably end before we have a hard freeze. The cooler the days and nights get, the less they’ll hit topwater. 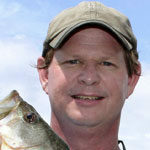 And before you know it, the topwater bite will just disappear,” said Partin.